The excavation of Cave No. 16 at Ajanta was ordered by Varahadeva, the minister of King Harishena in the late 6th century A.D. The entrance gate to this cave is carved with an elephant on either side. This monastery with its colossal hall, ornate doors and windows, beautifully painted galleries, sculptures, ornamented pillars is a architectural beauty that makes it one of the most striking in the series. This is a monastery that consists of a central hall surrounded by 14 cells on three sides, vestibule and a sanctum for Buddha image. The veranda has octagonal columns. The sanctum of this cave is devoid of doorway and antarala. The sanctum has Buddha image seated in pralambapadasana. Originally the entire cave was beautifully painted but now very little of the painting now remain. Several interesting scenes from the life of Buddha such as the infant Buddha, Siddhartha at school- drawing the bow, miracle of Sravasti; and other Jataka stories are depicted. 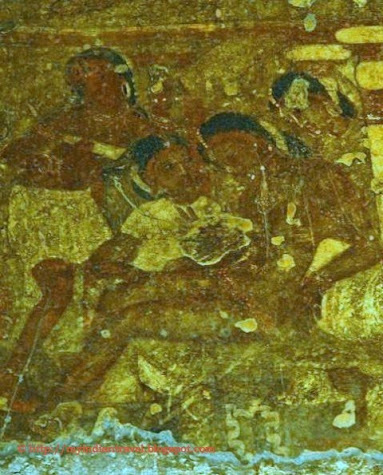 The "Dying Princess" is considered to be one of the important paintings produced in this cave. The princess is wife of Nanda the cousin brother of Buddha. She fell ill after hearing the decision of her husband that to renounce the crown and to become a monk. The dying woman with drooping head, half-closed eyes, and languid limbs, reclines on a bed. Apart from painting there are beautiful sculptures in the cave at the juncture of pillars and ceiling. So nice and interesting, great shots! These shots are divine, depicts life from yesteryears very well! I love the elephants and cool angle you got of the sculpture on the pillar/ceiling. That's a magnificent cave. Hello, what a cool place to explore. Great photos. What an amazing place - it has such a sense of history. I like the name Ajanta. It's the name of a good restaurant here. It is usually not possible to die just because you are disappointed! Perhaps she was fortunate!! What a remarkable place this is -- When I think of caves, I think of dark, damp places with things growing on the floors and ceilings.... this is certainly not like that. It is a beautiful remarkable monument. Amazing. Such a rich place you have there. Love that statue on the roof! I am always amazed by the intricate sculptures and the delicate carving done on these very ancient places. wow... so much history and stories in those caves. Beautiful!! Great pics of Amazing Ajanta, Rajesh!